Dave Fredericks explores the tragic story of Little Waltee, the four-year-old son of Titanic Trimmer Walter Fredericks. In my previous piece on the life of Titanic survivor Walter Francis Fredericks, I touched briefly on the death of his eldest child in 1916. This account intends to explore that incident more thoroughly. 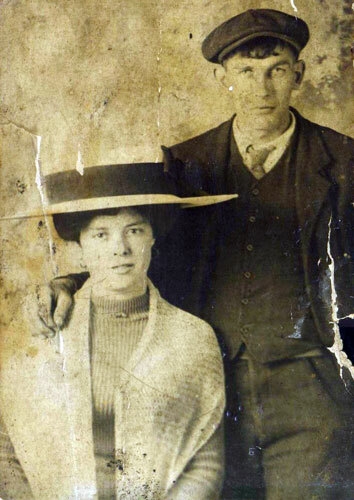 Ethel Fredericks was eight months pregnant with their first child when she learned the ‘unsinkable’ ship Titanic that her husband Walt was working aboard as a Trimmer had sunk - killing two thirds of its occupants. Having lost her own father at a young age, she now faced the possibility of being a single mother herself. The days of not knowing were so agonising it is a surprise she did not have the baby there and then. Eventually though, the survivors list came, along with much relief at the sight of Walter’s name. He would be home in time for the birth, and just ten days after his return to Southampton, held their child - a boy - in his arms. Walter Charles Fredericks was born 10th May 1912. He was affectionately nicknamed ‘Little Waltee’ by his parents and despite being small was a well known character within the Chapel neighbourhood. His younger brother Bill was born 16th September 1913 and although the two brothers played well together at their home, Little Waltee enjoyed playing outside with the older boys around the area of Chantry Road and Albert Road where they lived. One of the games that the older lads liked to play was to sneak up alongside or to the rear of the passing timber trolleys in order to hang on for a short ride. As adults we recognise this as being a dangerous pastime, but as a child it was a challenge and great fun. In fact, the author recalls doing a similar thing in his own childhood, but instead of horse drawn timber trolleys, electric milk floats were targeted for hitching onto! The local timber yard in Chapel was owned by Messrs. Tagart, Morgan & Coles. They were a well established firm, and provided employment for plenty of local people. One of those employees was 54 year old Jesse Woods who resided at Conway Terrace, Peterborough Road in St Marys. It was his job to transport timber from one depot to the other via a horse drawn timber trolley. On the afternoon of Wednesday June 14th, 1916, Jesse was transporting a load of timber from the direction of the Floating Bridge in Northam. He had recently just shooed away a boy he had spotted trying to jump onto the trolley, but shortly afterwards, he felt his rear offside wheel go over something followed by the sound of a woman screaming. He immediately pulled up to a stop. That screaming woman was Martha Williams (grandmother of local historian Genevieve Bailey) who was outside her home of 35 Chantry Road when she saw four year old Little Waltee miss-time his jump from the moving trolley. As he landed he lost his footing and stumbled to the ground whereby the back wheel of the laden trolley went clean over him - crushing his small torso. As Martha sat cradling the broken body of Little Waltee, a crowd soon gathered at the scene of the accident on the corner of Chantry Road and Albert Road. Accident location marked with a red dot. Note: due to the Blitz in WWII and the building of the Itchen Bridge the topography of this area has changed somewhat. A runner was sent to the fire station in St Marys Road where the motor ambulance was housed, and it was dispatched immediately. Despite the best efforts of the crew, Little Walt’s life ebbed away inside the ambulance on the short journey to the Royal South Hants Hospital, where he was pronounced dead by house physician Dr Murphy. The impact had snapped the boy’s spine and fractured almost every rib – some of which had punctured his left lung. 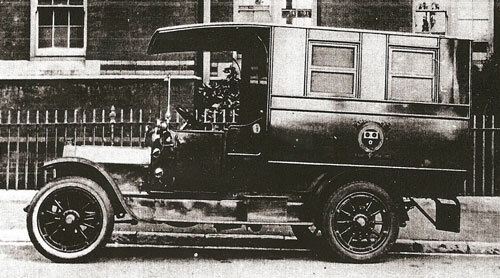 The motor ambulance based at St Marys. An inquest into the death was held two days later at the Coroner’s court by the borough Coroner - Horace Kelway Pope (whose name some may recognise as that who investigated the death of Titanic lookout Reginald Lee in 1913). Mr Pope called upon depositions from Jesse Woods, Martha Williams, Dr Miss Murphy, and Frederick William Smith – who was managing director of Tagart, Morgan & Coles. Mr Smith stated for the record that Mr Woods had always borne an exemplary character, and had never had an accident before in his 25 years with the firm. He also expressed his deepest sympathy with the parents Walter and Ethel Fredericks, who were grieving in the court throughout the hearing. Walter was home temporarily from his duties aboard the Hospital ships used to ferry wounded soldiers back from the continent throughout World War One. The jury returned a verdict of ‘Accidental Death’, and exonerated the driver from all blame. They too expressed their sympathy with the parents, in which the Coroner joined, the latter saying that it was a wonder more accidents did not happen to children who rode on or ran behind vehicles in the streets. 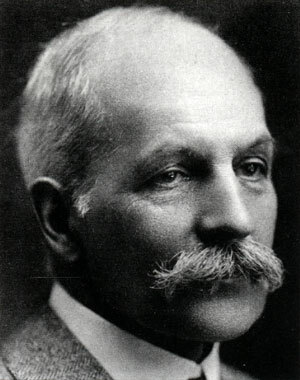 Frederick William Smith – managing director of Tagart, Morgan & Coles, took pity on the Fredericks family. Little Waltee can be found in plot N 148 150 of the Southampton Old Cemetery. As well as sharing it with his grandfather, he also shares it with his sister Phyllis (died 1923) and his mother Ethel (died 1924), but to this day the only memorial ever erected was that provided for ‘Little Waltee’ by Frederick William Smith. 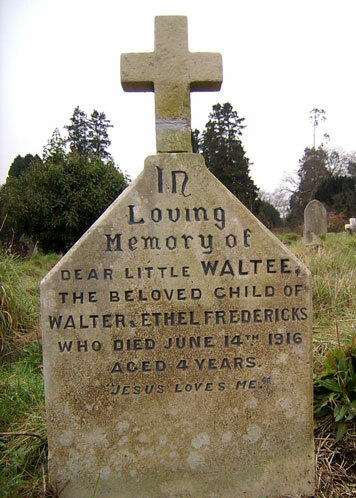 The gravestone of Walter Charles Fredericks – Better known as Little Waltee. Written and researched by David William Fredericks. Thanks to Brian Ticehurst for proofreading, input from historians Genevieve Bailey and Jim Brown. Also Alan House of Hampshire Fire & Rescue, and Tim Craven of Southampton Art Gallery. Researched at Southampton Reference Library and Southampton Archives.